Home | New Releases | Nelson Boren Handsigned and Numbered Limited Edition Giclee on Paper:"Leather Straps"
Nelson Boren Handsigned and Numbered Limited Edition Giclee on Paper:"Leather Straps"
About the Artist: Nelson Boren is a nationally renowned cowboy artist who has been painting professionally since 1988. 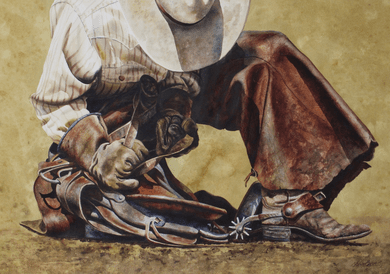 In addition to numerous solo and group exhibitions, his work hangs in such museum collections as the Buffalo Bill Historical Center in Cody, Wyoming; the Museum of Nebraska Art; the Booth Museum of Western Art; as well as in many private and corporate collections. "Many of the scenes I paint today are inspired by my high school years when I worked summers on a ranch. I hauled hay, fixed fences, helped drive cattle, and learned that cowboys are honest, hardworking men. I still feel that way and try to paint them with both the humility I experienced and with the history that has made the American cowboy an icon." (Nelson Boren) Nelson presently paints and lives on a small farm in North Idaho. When he's not painting he can be found fixing fences, working the land, gardening, or puttering on some new project. Besides his wife and children, his other real passions include fly fishing, hiking, and serving others. Prior to his art career, Nelson owned his own architecture firm, winning many design awards for his creative commercial and municipal buildings. Home | Framed Art | Western Art | Nelson Boren | Nelson Boren Handsigned and Numbered Limited Edition Giclee on Paper:"Leather Straps"
Home | Fine Art Prints & Limited Editions | Greenwich Workshop | Nelson Boren | Nelson Boren Handsigned and Numbered Limited Edition Giclee on Paper:"Leather Straps"
Home | Fine Art Prints & Limited Editions | Western Art | Nelson Boren | Nelson Boren Handsigned and Numbered Limited Edition Giclee on Paper:"Leather Straps"